In honor of Sci-Fi November, I’m featuring sci-fi picks for my Waiting on Wednesday posts this month. Up next is this highly anticipated third volume of Emma Newman’s Planetfall sequence, though like the previous installments, it can be read as a standalone! “After months of travel, Anna Kubrick finally arrives on Mars for her new job as a geologist and de facto artist-in-residence. Already she feels like she is losing the connection with her husband and baby at home on Earth–and she’ll be on Mars for over a year. Throwing herself into her work, she tries her best to fit in with the team. Ooh nice pick! Totally new to me one! Hope you love it once you read it! I’m BEYOND excited for this! I feel like Newman gets better and better with each book. I think she does too! I really need to get to her Tor.com novellas! That sounds creepy. Very cool. I want this book so very much as I adored the other two! Excellent choice. Arrrr! Yeah, I had a good time with Planetfall and I thought After Atlas was even better! This one sounds like another “mystery”, which sounds right up my alley! Ooh I like the sound of this one. Imagine finding a note in your own handwriting and not remembering writing it- that would be creepy! Plus the MArs angle of course. 🙂 Sounds pretty good!! That would definitely freak me out! Oooo this sounds neat. All I saw was “Mars” and “wedding ring” and I was like O_O I hope you enjoy this book when you get the chance to read it! This sounds so good – and I like that these can be read as standalones. I haven’t read the previous books but hopefully will do but, just in case, good to know I can dive straight in with this one. It sounds a bit like a psychological mindbender which I think I would like. 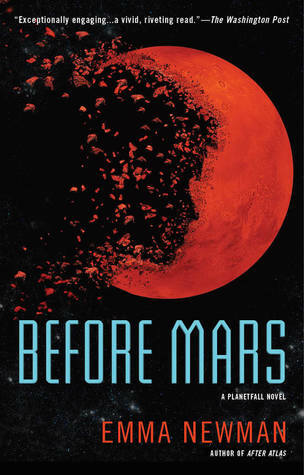 I haven’t read any of the other books in this series, but I’m super excited for Before Mars. It ticks so many boxes for me!